Henry Charles Hardy was born on 9 June 1889 at Yeovil Marsh. He was the son of engine driver, later laundry owner, Edwin Thomas Hardy (1861-1921) and Ann Maria née Brown (1862-1937). In the 1891 census Edwin and Mary were living in Yeovil Marsh with their four children; William Thomas (b1883), Annie (b1885), Edwin George (1887-1914) and 2-year old Henry. Edwin gave his occupation as an engine driver in a glove factory. By 1901 the family had moved to 10 Victoria Road and there was another daughter, Mary Alice (b1894), to complete the family. By the time of the 1911 census Edwin and Mary, together with Henry and Mary Jnr. had moved along Victoria Road to number 24 (or else the road was re-numbered, which was quite common in Yeovil around this period). Edwin gave his occupation as a laundry proprietor and Henry was listed as a laundry worker. Henry's older brother Edwin George was a professional soldier who had joined the army in 1904 and saw service with the Worcestershire Regiment in India. On the outbreak of war in August 1914 he was sent to France but was killed in the day-to-day trench warfare at Vailly-sur-Aisne on 20 September 1914 - just a month after war was declared. He was aged 28. Henry enlisted at Yeovil, joining the 7th (Service) Battalion, Somerset Light Infantry. His Service Number 25523 suggests that he enlisted at the end of May 1916. He was most likely sent to France in October 1916 at which time the 7th Battalion were fighting in the Battle of Le Transloy Ridges (1 to 18 October 1916). After the battle the 7th Battalion resumed daily life in the mud of the Somme trenches until 9 October 1916 when the Battalion left the Front Line and was billeted, first in Corbie then an the 19th to Allonville. Several moves followed until 12 December when the Somerset men relieved the 10th King's Royal Rifles in the trenches between Les Boeufs and Morval. The private diary of Colonel Troyte-Bullock (commanding 7th Somersets) records an interesting item concerning this period that was repeated in the Regimental History of the Somerset Light Infantry "Sergeant Dawson, who was always a keen patroller, went out into No Man's Land as soon as the relief was completed to have a look at the wire. He got some way into No Man's Land when he became hopelessly bogged and unable to move. He was found by a party of 5 Bosche who proceeded to pull him out. He, of course, expected to be taken off to the Hun lines, but not a bit of it. They informed him that they were his prisoners and demanded to be taken across to our trenches. Sergeant Dawson had hopelessly lost his way and said so, but they said it was quite all right as they knew the way and conducted him back to our advanced Bn. HQs. On the way they picked up another of our men, also bogged, and took him along with them. Major Preston-Whyte (temporarily in command of the Battalion) was somewhat surprised when the sentry shouted down to say that there were five Huns coming down the stairs!" In February 1917 Henry was wounded in the day-to-day fighting in the trenches and hospitalised at Boulogne, where he died from his wounds on 19 February. He was 27 years old. 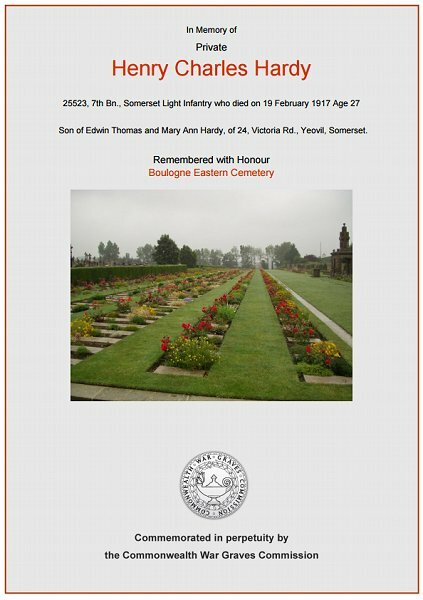 On 12 March 1917 the Western Gazette reported "Mrs Hardy of Victoria Road, has received an unofficial message, stating that her son, Private H Hardy, of the Royal Engineers (sic), has died of wounds received in action. This is the second son Mr and Mrs Hardy have lost in the war." Henry was interred in Boulogne Eastern Cemetery - Grave VIII.B.184 and his name is inscribed on the War Memorial in the Borough below the name of his brother. Other Yeovil men buried in Boulogne Eastern Cemetery include - Albert Bowden, Horace Heard and William Warren. The Commonwealth War Graves Commission certificate in memory of Henry Hardy.